The 2018 Australasian Viral Hepatitis Conference was held in chilly Adelaide earlier this month, and the hot topic of conversation among delegates was making sure not one single person living with hepatitis B and/or hepatitis C is left behind as we work towards elimination. There were many papers delivered on a variety of issues across two and a half days, with a good mix of community and clinical sessions. The program helped highlight that a lot of inspirational work is being done by some very dedicated and innovative people. Hepatitis NSW had a number of staff in attendance, with Kyle Leadbeatter, Win Yee Tan and Grace Crowley giving oral presentations on their respective projects and Mina Kim with a poster presentation. Overall it was an optimistic, innovative and participatory conference which highlighted that not only is real progress being made in addressing the hep C epidemic, but that hepatitis B is an awakening goliath. In Australia we now have a greater number of people with hep B compared to hep C due uptake of hep C cures. 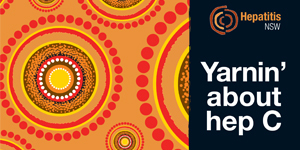 For hep B, health promotion programs linked with clinical services to provide screening opportunities are greatly needed for high priority populations – Aboriginal and Torres Strait Islander peoples, and culturally and linguistically diverse backgrounds – to ensure they receive effective health care management. For example, Training Aboriginal health workers to conduct fibroscans in Queensland was one practical and innovative project discussed. Substantial initial progress has been made, in Australia, to lay down a foundation of work to help support people living with hep B into testing and liver health monitoring but, as was pointed out in relation to hep C, it takes years for community relationships to be developed and maintained and for trust to be built with people living with hepatitis. We absolutely must continue the funding that Hepatitis Australia was able allocate to state and territory hepatitis organisations to reach communities of people living with hepatitis B. There were positive speakers in all plenary sessions, speaking to their lived experience of hep B, hep C, stigma, alienation, treatment, cure and hope. They made powerful contributions to the conference and to the work of all people working in the viral hepatitis sector. Stigma and discrimination still remains a problem, and therefore healthcare workforce education remains a priority. Nurses are a cornerstone of eliminating hep C. Nurse-led models should be prioritised, scaled-up, and supported. We need to think more about methamphetamines in the hep C space. Opioid Substitution Treatment (OST) and Direct Acting Anti-Virals (DAAs) are a perfect combination but we must consider how we address the hep C-related needs of people who use methamphetamines, especially in rural NSW. Rapid testing will make a huge difference to working with hard-to-reach populations. Every extra unnecessary step of testing creates a potential loss of follow-up, and a potential risk of transmission, between appointments. Being able to get a hep C PCR (HCV RNA) result in 60 minutes or less is the next revolution needed in eliminating hep C.
There are many youth focused hep B hip-hop projects around Australia which can be shared across communities. Harm reduction strategies and programs are essential to reduce incidence and prevalence, particularly among people in custodial settings. For example, approximately 43% of people in NSW prisons are hep C antibody positive. There is an urgent need to provide needle and syringe programs for people in custody. Great news was presented, based on NSW data, that 2017 saw a decline in deaths from hep C-related liver disease as a result of the new DAA treatments. The conference provided superb networking opportunities with the sharing of good and practical ideas. We look forward very much to discussing further, and translating the research findings and project successes presented at the conference into practice in our ongoing work at Hepatitis NSW. And we look forward to Sydney hosting the 2019 Australasian Viral Hepatitis Conference – AVHEC 2019 – on 5-6 August. Amidst all the good feeling and positivity of the recent World Hepatitis Awareness Day, Hepatitis NSW was honoured to receive recognition of one of our resources. On 27 July, the Centre for Social Research and Health (CSRH) at the University of NSW announced the winner of their inaugural National Competition for Excellence in Hepatitis C Health Promotion. First place went to the Cairns Hepatitis Action Team (CHAT) website. Congratulations to the CHAT team for developing a great project! If you think this resource looks like something you or your clients could use, you can order FREE copies of Yarnin’ about hep C from our online Resource Library or take a look at our other free resources. Maviret listed… don’t forget to update your resources! 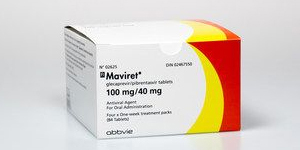 Maviret, manufactured by Abbvie, is a pangenotypic DAA that works by stopping the hep C virus from multiplying and infecting new cells. One huge benefit of Maviret is that it shortens treatment duration for most people down to only 8 weeks, and cure rates are higher than 95%. 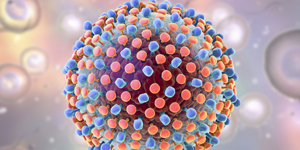 CURES FOR HEPATITIS C: treatment update sheet is a simple, single A4 sheet produced by Hepatitis NSW that provides detailed current information about hep C treatment. Maviret’s listing means that your current stocks of the sheet may now be out-of-date. Please discard your existing supplies of the update sheet and order new supplies >>>CLICK HERE. 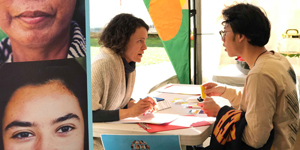 This year for Hepatitis Awareness Week, Hepatitis NSW partnered with South Eastern Sydney Local Health District and the University of NSW (UNSW) to hold an on-campus hepatitis B awareness event for university students – and what a busy day it was! Attracted by the prospect of free hepatitis B tests and Fibroscans, a snaking queue of university students began to build around the event marquee even before setup was complete. Remarkably, the queue never really subsided throughout the day, only increasing in popularity between classes and at lunchtime. Whilst waiting in line, the students completed hep B quizzes, and took turns at spinning the Hep B Wheel of Knowledge. They also had the opportunity to speak with specially-trained volunteers. By the end of the day, the two tireless nurses had tested 80 students for hep B, on top of conducting 41 fibroscans! It was a great result, and certainly a memorable day. Congratulations to all involved, and we’ll see you at the next Hepatitis Awareness Week, UNSW! Hepatitis NSW’s Cheryl Burman Award is an annual award that will be presented at our Annual General Meeting and Audrey Lamb Community Forum on Thursday 29 November. It is awarded to a person, group of people or to a project where outstanding work has been carried out to work towards elimination of viral hepatitis in NSW. This work could be in the advancement of treatment, support, information provision, prevention or management for people living with viral hepatitis. The award pays tribute to Cheryl Burman (pictured), who provided exceptional leadership in the early days of the NSW viral hepatitis response. 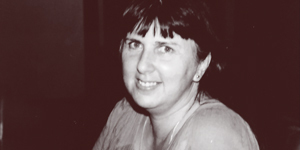 Cheryl served on the Board of the Hepatitis C Council of NSW from 1993 to 2000, and as our President from 1995 to 1999. Cheryl made significant contributions to the governance and leadership of Hepatitis NSW. If you know a person or a group of people who have done outstanding work in NSW in the fight against viral hepatitis, then please consider nominating them. Nominations close 5pm Monday 24 September 2018. Hep B grants were made available by Hepatitis NSW for Aboriginal Community Controlled Health Services in NSW to help them deliver hepatitis B health promotion activities to their local Aboriginal communities. 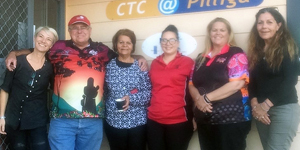 We were delighted to award one of those grants to The Bila Muuji Aboriginal Corporation Health Services Inc.
On behalf of Bila Muuji, the Walgett Aboriginal Medical Service (WAMS) organised events to be delivered in Walgett town, Pilliga village and Gingie Mission. Activities were delivered in collaboration with staff from Hepatitis NSW, Dubbo Sexual Health (Aboriginal Health Practitioner) and the WAMS. Over three days, more than 50 Aboriginal community members participated in hepatitis B screening and health promotion. Cultural safety was assured with the support of local Elders and Aboriginal staff. The project supported community engagement through catered events, incentives of a $30 voucher for a nurse consult, some transport was offered and a further $30 voucher for participants when returning for screening results. Many of the multidisciplinary team drove well over 800 km through drought affected country, racing kangaroos, emus and the blinding setting sun to deliver these events safely in strong partnership with local Aboriginal community. The local support from both Aboriginal community and staff alike was wonderful and testament to the success of the project. The Hepatitis B Community Education Projects were administered by Hepatitis Australia and funded from the Australian Government, Department of Health, under the Blood Borne Viruses and Sexually Transmissible Infections Prevention Program. 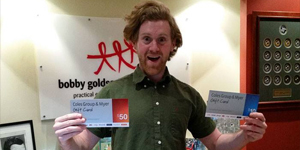 Congratulations to Warwick at First Step on winning a $60 gift card for our resources distribution survey. Warwick then chose to “pay it forward” and The Bobby Goldsmith Foundation, who received his donation, are very grateful – see Max from BGF at right accepting the gift. Our survey, to gauge how we promote and distribute our resources, was run over June and July with over 100 responses from across the state. Thank you to everyone who took the time to complete and return the survey. The feedback showed we were, on the whole, doing a good job but also gave us some suggestions on how to make the process even better and more focused.